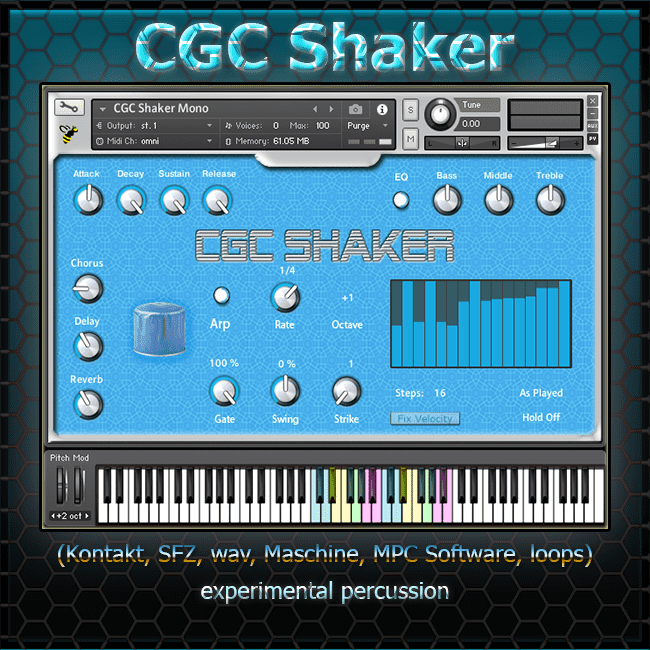 GC Shaker is experimental percussion sounding similar to shaker. It's made out of recordings of Camping Gas Cartridges (CGC) filled with sand (and small rocks). It's not that very predictive when in use, making similar but always different sound so we used many round robins to emulate that. Price is symbolic, while you can still go through payment process if you want to donate, it's free for email subscribers. Subscribe bellow and you will receive discount code into your inbox. Software requirements: minimum MPC Essentials v1.8.2 or MPC Software v1.9.6. Most instrument format versions use 880 samples each and 22 round robins per shaker type of movement. All formats use 24-bit samples. Instruments samples are unprocessed (raw) ie "dry" ready for further processing. If you don't like or have time to experiment there are bonus loops which can be used as is or processed further (they have a slight amount of applied effects but not much). CGC Shaker Mono and CGC Shaker Stereo. Both use different samples made in different recording sessions. -both movements (1 velocity layer). Each velocity layer has 22 round robin samples. If you forget which note triggers which sample type/shaker there is a message in the bottom left corner of kontakt instrument which will appear after you pressed the note. Turn info on (top row in Kontakt) too so you can see explanation/help (in the bottom part of Kontakt) of each gui control while mouse-hoovering over it. We made pads in different colors for the easier association, they are also named. 1 group per shaker type, all groups share same pad layout. Since Maschine doesn't have round robin feature for samples we did a simple trick to emulate that: different velocities trigger different samples. There are up to 22 different samples on a single pad. 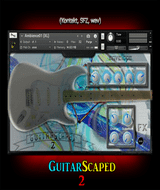 4 programs with mono samples and 4 programs using stereo samples. • CGC Shaker Akai MPC. 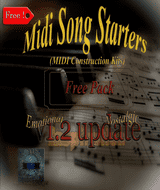 Contains projects for Mono and Stereo shaker, each has 4 programs for individual shakers. Just extract to HDD and open with MPC software. • CGC Shaker Akai MPC Expansion. 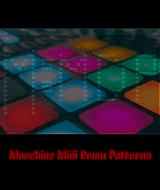 Contains all the same programs and samples as in the above-mentioned folder but it's in a form of Aki MPC expansion. 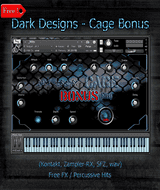 To install drag and drop CGC Shaker.xpn onto MPC software interface. There is no need to have both installed, you can use which one is more convenient for your workflow. In all programs, no effects were used. All programs contain samples on all 16 pads in pad bank A. All have 4 round robins on each pad. Slightly fewer samples were used for MPC software programs but nothing too drastic compared to other formats. As a bonus, we made a huge amount of loops with CGC shakers. 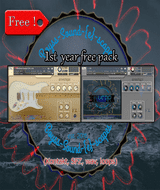 CGC Shaker Loops Organic contains over 200 wav loops at 96 Khz and 44.1 Khz, both 24 bit. They are called organic because they weren't made with this virtual instruments but with “shakers” themselves. Loops were not quantized, they have natural swing applied. While in instruments above wav samples are very dry, so you can process them with your favorite effects, loops have eq, compression, delay and reverb applied to them but just in small amounts. Used BPMs for loops: 86 and 120. We wanted to cover a wide range, 86 bpm loops can be used at doubled bpm (172) without changing, 120 bpm loops for bpm ranges that 86 bpm loops couldn't cover (110 or 140 etc). OR Subscribe here and Get Library for FREE!